This cute little skirt was designed for my daughter. She is obsessed with skirts and I don't say that lightly. She will change her skirt at least 3 times a day. If you match gauge and follow instructions it should fit a 19-21 inch waist. I have provided instructions below which should enable you to adjust the size. 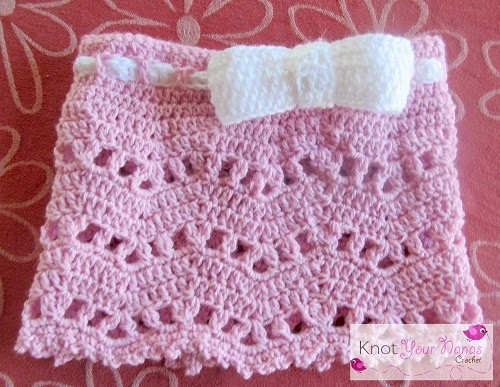 This size of this skirt can be adjusted provided your starting number of stitches is in multiples of 14+1. You can also increase the length by repeating rows 8,9,10,11 and ending on row 9 before adding the finishing round. · 8 ply/dk yarn in pink (55 grams) and white (15 grams). I used Moda Vera Marvel. 4 dc cluster: Yarn over, insert hook into first st, yarn over, pull up a loop, yarn over, pull through first 2 loops, yarn over, insert hook into same stitch, yarn over and pull up a loop, yarn over and pull through 2 loops on hook, skip one stitch, yarn over insert hook into next st, pull up a loop, yarn over, pull through 2 loops on hook, yarn over, insert hook into same st, pull up a loop, yarn over and pull through 2 loops. You should have 5 loops on your hook, yarn over and pull through all 5 loops. Dc2tog over 3 stitches: Yarn over, insert hook into first stitch, yarn over and pull through stitch (3 loops on your hook), yarn over and pull through the first 2 loops on your crochet hook, (2 loops on hook), yarn over, SKIP ONE STITCH, insert hook into next stitch, yarn over and pull through stitch, yarn over and pull through 2 loops on your hook, yarn over and pull through remaining stitches on your hook. Without twisting current rows join with a sl st to top of ch 2 to make a continuous circle. Round 3: Ch 4 (counts as beginning ch 3 + ch 1), skip 1, dc into next stitch, *ch 1, skip 1, dc into next stitch*. Repeat between *around. Ch1 and join to 3rd ch in beginning ch 4. Round 8: Ch 3 (does not count as a stitch), *4 dc cluster over the next 3 stitches (see note, start in same st as ch 3), ch 3, skip 2 st, 2 dc cluster in the next stitch, ch 2, skip 2 st, (2 dc cluster, ch 4, 2 dc cluster) in ch 1 space, ch 2, skip 2, 2 dc cluster in next stitch, ch 3, skip 2* Repeat between * around. Join to middle of 4 dc cluster with a sl st. Round 9: Ch 1, *sc in top of 4 dc cluster, 2 sc in next ch 3 space, 2 sc in next ch 2 space, 5 sc into ch 4 space, 2 sc in ch 2 space, 2 sc in ch 3 space* repeat between * around. Join to first sc with a sl st. Round 18: Ch 1, sc into the same stitch as ch 1, ch 3, sl st into the 3rd ch from the hook, sc into the next stitch. *sc into the next stitch, ch 3, sl st into the 3rd ch from the hook, sc in next st* Repeat between * around. Join to first sc with a sl st. Skirt should measure 8 inches in length. Continue repeating rows to increase length. Stitch small gap closed and weave in ends. Wrap centre of bow around bow and stitch closed. Weave in ends. If making a bigger or smaller size skirt ch 3 less than the starting ch. Weave the belt in and out of the loops created in round 3. Sew bow to right side of belt and sew button on the back. Push the button through the dc rows on the belt to secure. Thank you so much for shearing :-) how old is your daughter? I want to make this for my niece who turnes one tomorrow, and I'm not sure a boîte the size..
My daughter is 2 1/2 with a 20 inch waist. I would probably start with 70 ch for a 1 year old. The belt will be able to pull it in a little so the skirt will grow with her for awhile. You can also adjust the rows according to the length you want it. Thank you for the pattern fo this oh so pretty skirt :)..I have a doubt tho..the 2DC cluster..is it worked into one chain or 2..instructions in the link say 2..at least I think it does.. I can see how that might be confusing. In this pattern the 2 dc clusters are worked in the stitches specified or the ch space.